I am an Amazon Prime member. I have an Amazon Fire HD. I pay for Kindle Unlimited. I have an Amazon Echo. I like the Amazon infrastructure. Oh wait. What's that? Amazon Echo? It may be the one that finally turns me off a system I really enjoyed. I got my Echo back in December. Magical. Much more responsive to voice control than my Moto X Pure phone which uses the Google Now system. Ok, the Echo's search and intuitive responses weren't quite as good as Google's - how could it be - but the way you could speak to it and have it respond was much better. 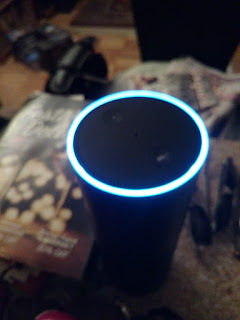 I got a kick out of showing guests how I could just casually say, "Alexa, what's the weather for tomorrow" without having to speak like a robot or shout, and it would respond immediately. But mostly I used my Echo for music playbacks. And it was never a problem until now. It has developed a strange bug and, although it seems easily corrected, there seems to be no way to fix it, and - this is the frustrating part - apparently no way to make the people at Amazon understand what the issue is. After seven emails to the help desk at the Echo app over the last week trying to explain the issue, I tried one more time. I got passed around to three reps this time. I especially enjoy the snark from the rep at 10:48 PT saying he didn't want to waste my "precious time." Below is my last online chat with them. And, again, this is my eighth time trying to get help with this issue. 10:19 PM PDT Ashok(Amazon): Hello, my name is Ashok. I'm here to help you today. 10:21 PM PDT Me: Will you be the correct dept to take care of it because it really seems to be a tech issue that no one there seems to be able to fix? 10:22 PM PDT Me: Hello? 10:22 PM PDT Ashok: I can understand your concern. 10:23 PM PDT Ashok: No worries, please hold on a minute while I check on that for you. 10:27 PM PDT Me: Hi how long do your responses take? Are you still connected? 10:27 PM PDT Ashok: A member of our Amazon Echo Specialist team will need to help you with this; however, they don't have chat support and unfortunately, phone service support is also out of hours. .
10:28 PM PDT Ashok: Please hold on a minute while I forward this information to our Amazon Specialist team on your behalf. 10:30 PM PDT Ashok: Yes, I'd like to help you, please wait, let me connect your chat to our Appstore team. 10:31 PM PDT Swetha(Amazon): Hi James! 10:31 PM PDT Swetha: I'm Swetha from Amazon Digital Support! 10:32 PM PDT Me: Thanks. And Hi Swetha are you able to see what the issue is? 10:32 PM PDT Swetha: Yes James! Please allow me a moment while I check your previous correspondence. 10:32 PM PDT Swetha: I'm sorry about that! 10:33 PM PDT Swetha: From the issue what you have described, I understand that you are having a problem while accessing Amazon Echo app. 10:34 PM PDT Swetha: My sincere apologies. 10:35 PM PDT Swetha: Are you referring to the Order #116-4325902-7753841 placed on Tuesday, November 3, 2015 9:01 PM (PST) ? 10:37 PM PDT Swetha: Sorry about that. I understand the problem. Let me connect you to the Mp3 specialists. 10:38 PM PDT Me: not MP3 it is ECHO do you know what that is? 10:38 PM PDT Amit(Amazon): Hello my name is Amit. I am a part of Amazon Mp3 support team. I'll certainly try to help regarding your concern. 10:39 PM PDT Me: Why? It is not an MP3 problem it is Echo is anyone there on the ball? 10:40 PM PDT Amit(Amazon): I'm sorry we were disconnected. I can pick up where we left off. 10:41 PM PDT Amit: James, Echo is also a part of Amazon music. 10:41 PM PDT Me: hey thats good will you actually realize what the problem is or this a joke for Amazon? 10:42 PM PDT Amit: May I know the problems you are getting with your Echo Device? 10:42 PM PDT Me: Ok I have explained it about 8 times I guess i have to try again? 10:45 PM PDT Amit: James, I don't want to misguide you but Echo troubleshooting team is available on call only. You can reach Echo Customer Support by phone directly and toll-free at 1-877-375-9365 or by e-mail at alexa-support@amazon.com. They're available from 3 a.m. to 10 p.m Pacific time, seven days a week. If you need to troubleshoot your Echo device, we recommend that you contact Echo Customer Support by phone. When you contact them, please make sure you have the device and any accessories that came with your device with you. 10:47 PM PDT Me: what is going on there? 10:47 PM PDT Amit: James, its a part of mp3 but really we do not have necessary tools to troubleshoot the echo issues. 10:48 PM PDT Amit: So I request you to please contact the Echo Team directly on call. I do not want to waste your precious time. 10:49 PM PDT Amit: I've passed your feedback to the Amazon technical team for consideration as we make future improvements. Customer feedback like yours really helps us continue to improve our products and provide better service to our customers.